What differences my husband and I have had over economics usually has stemmed from our families’ disparate philosophies of purchasing. I grew up with K-Mart Blue Light Specials, hand-me-downs and scavenging. Bottom line: cost. My husband was raised buying Sear’s Best. Bottom line: the best quality you can afford. Buying shoes (for us as individuals and for our children) threw us into the midst of the cost vs. quality conundrum. I just groan at the thought of paying more than $15 for a pair of shoes. Still. When Curt was teaching, standing on a cement floor all day, we paid obscene amounts for Rockport shoes on his $18,000 salary. When it came to snow boots there was only one brand worth considering: Sorels with removable felt liners. I argued “They’re just little boys! How did my four brothers survive without Sorels?” Curt was unmoved. I gulped and started to watch for sales. So we bought Sorels every year for our growing kids; we scored two pairs at a garage sale but canceled that out eight years later by buying a size we already owned. The powers that be decided that I needed a pair of Sorels for my dear big feet. Moi? Si vous plait! Those ugly white boots have been hibernating for at least four or five years, banished to some secret cubby in the garage. But DH retrieved them today so I could start walking outside in between afternoon blizzards. Dear Dana convinced me to join her on the Idita-walk. I have access to a free gym, but there’s something wonderfully bracing about the fresh air and plowing through the snow feeling like Madam Shackleton. I’m listening to Einstein while I walk which is an utterly ludicrous proposition. Not that I’ll “Get It”; perhaps quantum physics will distract me. Maybe I’ll snap some pictures. The Idita-walk officially begins February 1. I’m already cheating and adding today’s minutes in the total. Check my progress on the sidebar box. Walk 1049 minutes the next two months. Care to join us? I used to LOVE my walks through the 3′ drifts in the Minnesota winters… and I NEVER had Sorels! In fact I think I had a cheap pair of moon boots that I wore for years. Hey, they worked. My husband is like yours though, for a lot of items… just certain things he wont compromise on, like tools, guns, kitchen appliances for me (yeehaw!) and of course, his desert hiking boots. The funny thing is, I like them! I think they’re feminine-looking, and sturdy-looking, too. Coming from California, of course I’ve never heard of Sorels. Rockport, yes, Sorels, no. But I nearly got blown over in the rain, walking to my car today, if that counts for anything. And who is Madame Shackleton, pray tell? They look hideous on. Hideous. And they are honkin’ big. I’d send them down to you but looks like I’ll be needing them….I am amazed, amazed!, to know a consumer product that you don’t know. Remember when I didn’t know Applebees? Remember when I didn’t know Stone Cold Creamery? Remember when I didn’t know California Pizza Kitchen? I still don’t, on that one!Madame Shackleton would be the feminized version of Sir Ernest Shackleton, the man who led an expedition to the South Pole. The story is chronicled in the book Endurance, one I highly recommend. The movie version was just Okay. hahahahahaha. Cold Stone. Cold Stone. Cold Stone. I shall probably walk 2700 minutes in the next two months. Our family walks 45ish (brisk) minutes every evening–and has for around 9 years. I don’t think the boots look that bad! Actually I think the boots are kinda cute~~~ I haven’t walked in so long and am inspired here to start back up. But what a little wimp am I??? If it is 60 and raining I make excuses for myself. Manana! Wow, Kathleen. You will be lapping the rest of us!Maxine, don’t go too hard. Your body has been through much lately. I was raised in much the same way as you were in regards to shopping. Goodwill, St. Vincent de Paul, the Dollar Tree, and Grocery Outlet were all well known to us. However, in the shoe department my mother never compromised. It probably has something to do with what she does for a living. So we wore clothes from Goodwill with our top end tennis shoes and casual shoes (we did get cheap dress shoes given that we spent so little time in them). I wish I could go walking with you. 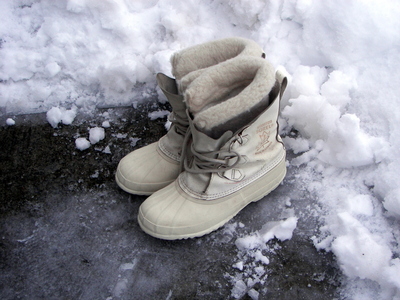 I have some big snow boots as well–though they are Columbia’s and a shade of lavender that matches my winter coat! OH the UGLY boots………. “boots” if thats what you can call them………I prefer to call them the shockinglly repulsive unsightly “things”……. I hated those boots. I think I would walk to school in those “boots” and then right before I walked inside I woud change into a pair of “cool” shoes I had concealed into my back-pack just to avoid the “guff” I would receive from schoolmates. I actually think those boots are cute. However, I’m also a garage sale boot scavenger. I scoffed as you did the year I needed to buy my son a pair of hiking boots for his father/son trip out west.I also listened to that book on Einstein too, and also found it a bit difficult to keep up during the discussions of physics. I really wished I’d had the book in my hand so I could go back and slooowly take it in (and take notes). Keep with it, it does get easier (read: less physics).Enjoy your walks, what a lovely idea to do them as a group. I don’t think I shall join though, I’m a lazy whimp. I’ve always enjoyed winter most from the inside-out. That is, sitting by the fire and looking at the white stuff out the window! I move my walking indoors, too, using the Leslie Sansone videos. Though an outdoor walk in the “bracing” cold sounds wonderful~~I’ve had bronchitis for a month and the reality is that the cold air just doesn’t do me any good right now 😦 But that will make spring so much the sweeter. I have those exact boots. I think mine are older than yours. Your boots story makes me think of my childhood and all the snow and rain clothes in our front hall closet, just waiting for adventures to begin! Now i’m much more of an inside gal–) And, ColdStone or Stone Cold, i’d still totally have some of that on any temperature of day! !